Drums & Muskets is a game system that recreates battles of the 18th Century, from roughly the adoption of the socket bayonet through the French Revolution. Leuthen is the first game in the series. Designer Frank Chadwick has created an elegant set of simple game mechanics that seamlessly integrate command control, manoeuvre and morale with the uncertainties of combat. The battles of The Age of Reason are yours to refight with the Drums & Muskets series! The very existence of the Hohenzollern monarchy is in question. 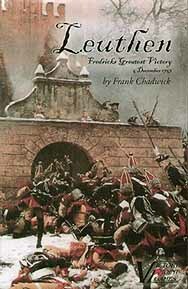 Prussia hovers on the brink of collapse after a string of defeats as the winter of 1757/58 approaches. Frederick throws his small army against an Austrian force nearly twice its size with time only for one desperate battle to redeem his fortunes before the snows fall.